We often consider our blessings as normalcies owed us and forget to be thankful for small things. We tend to forget to appreciate the roof over our heads, the running water in the bathroom, the loose change forgotten between the couch cushions, the family and friends all alive and well. What if you had to work long, physically laborious hours every day just to scrape by? What if your house was nothing more than a shack? And what if your mentally disabled son one day went missing? Most people would buckle under that amount of stress and pain, but Elizabeth Monyela didn’t allow herself to be debilitated by her pain; instead she started the Thuthuzela home for abused, needy, and neglected children in South Africa. MannaRelief received a call from Kimberly in Australia. Kimberly explained that her mother had just passed away. While her mother had lived in Australia, her heart had been with a small orphanage called Thuthuzela in South Africa. In continuing her mother’s legacy, Kimberly passionately pursued every avenue she could to help Elizabeth and Thuthuzela. Kimberly was well aware of the difference proper nutrition could make in the lives of the children living at the home. Our hearts broke as Kimberly shared the story of hardships Elizabeth has faced and we were elated to hear of her victorious rise above those hardships, as well as her determination to help less fortunate and abandoned children. Immediately, we were eager to partner with Kimberly to help Elizabeth and the children at Thuthuzela. whole food nutrition to South Africa that will be distributed among nine different organizations. Thuthuzela will receive 13,334 servings of proper nutrition and the opportunity to enjoy nutritious meals for six full months. MannaRelief is incredibly grateful for our supporters and we couldn’t do what we do without committed people like Elizabeth Monyela in the world. 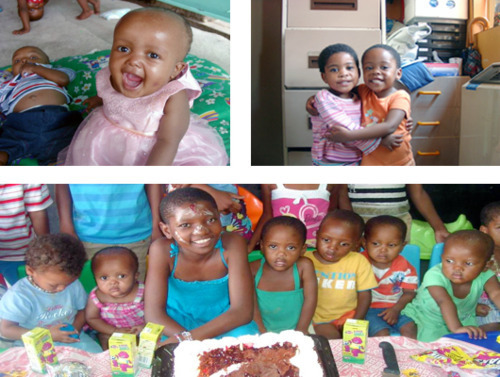 Below are a few pictures of children at Thuthuzela.